The morning began late at around 11:30AM rather than the 11:15AM start time advertised by the Vancouver Sun. There seems to be a real lax attitude with start times and all of the endless legal wrangling that go on for days. The morning began by Justice Mackenzie advising the jury that the Skytrain incident was caused by the father of Andrea Mackay. The Judge then advised the jury that he, "won't speak to you again!" But after the remarks to the jury, Michael Bolton began his cross examination of Martyn Brown. It was a morning that had huge news impact but don't look for it in the Vancouver Sun, read it here first! Bolton began by asking the question that lead to the objection from Mr. Berardino. Namely, did Martyn know about the cosy relationship between Kelly Reichert of the BC Liberal Party and the lead investigator from the RCMP, Kevin Debruyckere. Martyn responded that he learned this through the media. Bolton asked despite working closely with Kelly Reichert during each of the last 3 campaigns if he had any discussions with Reichert about his brother in law, RCMP officer Debruyckere. Mr. Brown responded, "he can't recall." Bolton also asked if Premier Campbell was ever interviewed by the RCMP regarding the BC Rail investigation. Martyn Brown did not recall.Bolton reminded Brown that other officials from the office of Premier Campbell had been interviewed. Did he recall any conversations about those police interviews? Martyn Brown could not. Asked if Premier Gordon Campbell knew of the relationship between RCMP team commander Kevin Debruyckere and Kelly Reichert of the BC Liberals, Martyn Brown responded with a curious comment. His answer was, "not to my knowledge." Brown went on to say that the RCMP have had discussions with Campbell but he can't recall if the issue of the cozy relationship ever came up. It was also learned today that Minister Rich Coleman had advance knowledge of the investigation and was actively assisting the RCMP with the search warrants on the BC Legislature offices. Mr. Bolton asked why Minister Coleman was involved when, it should have been the Speaker of the legislature. Mr. Brown could not recall knowing why. Much more to come regarding the relationship between Brian Kieran,Jamie Elmhirst and Erik Bornmann with key senior officials in the Gordon Campbell government. Another key email introduced by the defense that had jury members following every word. Maybe there's no session of the BC Rail Corruption Trial today, or then again, maybe there is. We of the "CULT" learned long ago that accuracy and/or promptness were not exactly part of the mission statement of the Attorney General's Court Services Online. I guess it goes along with a justice system where justice is merely given lip service, if that. Anyway, as of almost 9:00am PDT, there is NO MENTION of case 23299 (Basi, Basi or Virk) - though last week the word was that court would convene this morning at 11:15 or some such later time to accommodate a course being taken by a juror. They may as well start at 9:00am or 10:00am as at least half of the time the jury isn't included anyway. The Week in Courtroom 54 of the B.C. Supreme Court (June 22-24) and the Publication Ban in the BC Rail Scandal matter. The Publication Ban as Excuse …. The publication ban on matters involving the Basi, Virk, and Basi trial (the BC Rail Scandal) when the jury is not present - imposed by Associate Chief Justice Anne MacKenzie (2010 – 03 – 18), retroactively and in the present – is, I believe, misunderstood and misapplied ... and, perhaps – as well – was too enthusiastically put in place by her ladyship. It was, apparently, applied for neither by the Crown nor the Defence. As a result, Mainstream Press and Media [MSPM] journalists are, I believe, self-censoring. They cannot see clearly, it seems, what they learned outside of court in the past and what they learned in it – when the jury wasn’t present. [A very large amount of what has been said in pre-trial was said – in one way or another – in the legislature, and is recorded in Hansard (the legislature’s public record) from which anyone may quote freely]. Journalists of the MSPM often act as if all the information gathered in the last six to eight years is somehow prohibited from being referred to. As a result the public is being denied core information in the most important public criminal trial in the history of the province. And, more and more, anger is being expressed by ordinary people at the ban. The ban, in effect, denies the people of B.C. (and the rest of Canada) information they believe they have the freedom to receive. It would be, perhaps, seen as conspiratorial and neurotic to suggest the ban protects the Gordon Campbell forces especially. But I think it does. It would be, perhaps, conspiratorial and neurotic, as well, to suggest the ban permits the Mainstream Press and Media to avoid its obligation to inform the public of the full scope and significance of the BC Rail Scandal. But it appears to do just that, too. Not only does the MSPM refuse, for instance, to deal with the wrongful appointment of William Berardino as Special Prosecutor in 2003, it hides its head over his political donation (after appointment, in 2005) to the political campaign of Wally Oppal, successor to the Attorney General whose ministry made the wrongful appointment. On June 23 the daily giveaway paper 24 Hours reported that the Law Society found no evidence of professional misconduct on the part of Mr. Berardino when he made the donation “to the Liberal party without making the appropriate disclosure”. The report continued that the “Law Society has closed the file”. Of course. But the ladies and gentlemen of the MSPM shouldn’t have closed the file – and (of course) they have done so ... too. As if to prove my general point, Will McMartin (on the 24th of May) wrote an article for the TYEE on the devious manipulations engaged in by Gordon Campbell and his crew to offload BC Rail. The article is a close, chronological, step-by-step exposure of Campbell tactics, suggesting planned deviousness and deceit (perhaps criminal breach of trust) … the kinds of things one might expect to hear in banned times at the court. McMartin uses phrases like the “disinformation campaign”, the operation of Campbell and his MLAs “to drastically distort and misrepresent BC Rail’s financial health”, Campbell’s “unfounded assertion that BC Rail had cost taxpayers a billion dollars in subsidies”, “his campaign of distortion” … and much more. McMartin supplies chapter and verse to back those statements. No one suggests he has violated the publication ban. The consensus in the gallery, I believe, with respect, is that Associate Chief Justice MacKenzie tends to favour the Crown. Indeed, her partiality is demonstrated, it might be claimed, by her refusal to address the fact that the Special (Crown) Prosecutor was appointed in violation of the legislation governing the appointment process. Until she publicly addresses that huge anomaly, her objectivity and independence will remain under a dark shadow, sacrificing her own and the trial’s credibility. She has been fully informed of the matter but chooses to ignore the information. Married to her ‘appearance’ of favouring the Crown, the publication ban may excite a feeling of an unnecessary suppression of information. The publication ban is related (and is in opposition) to the fundamental principle that the court must be open in order to guarantee a fair trial. Secret trials (the wisdom of experience says) are unjust trials. Publication bans must be used, therefore, with restraint - to assure that the jury is not wrongfully led to bias. Since the accused are in the room when the jury is not, the major concern is with the jury – which (some experts suggest) is underrated in its ability to sift apparently contentious information and to make wise judgements. The members of the jury are spoken of as intelligent people who may fulfill the burdensome task of weighing and sifting evidence. At the same time they are cloistered from what some believe is random and contentious information as if they were inexperienced children. Opinion, however expert, has not changed the rules of protection for the jury. There is a lot of room between a fully open trial and a secret one. Somewhere in the gap a good deal of manipulation may occur to deny the public information it should have the freedom to receive (without anyone being able to name the trial “secret”). That may be the case with the Basi, Virk, and Basi trial as it is presently being conducted. If it did not, it would mean the judge on the case would have – constantly – to consider the needs and the freedoms of British Columbians, which I believe she never considers. A very simple matter in that regard is the misunderstanding of the publication ban. I believe she should have taken all the time necessary to discuss the ban in open court and to tell all in the gallery what she means by it. The material published by the Supreme Court of Canada, Docket 32719, on the Basi, Virk, and Basi matter needs explanation. She has not taken time to explain it, and so – I believe – the ban is generally misunderstood. From fear of being censured, journalists of the MSPM – and especially their editors – are self-censoring … ridiculously, I believe. And the self-censorship keeps work like that done by Will McMartin from ever seeing the light of day in the Mainstream Press and Media … which just happens to be what Gordon Campbell and his minions want. The ban (though pursuant to Section 648) is not total. It is on “the publication in any document or broadcast or transmission of evidence, submissions, rulings and reasons for judgement given in this proceeding in the absence of the jury”. The ban does not forbid reference to the matter of proceedings without the jury present. It doesn’t forbid ALL matter “given in this proceeding in the absence of the jury”. It SPECIFIES the matters banned. This week – the people of British Columbia may be told – a few days were spent in wrangling, clarifying, investigating, and instructing the jury about the event on the sky train platform at the Patterson stop when a man approached two of the jurors and said something to them about the trial. As a result, everyone is much more aware of the need for those in the gallery to stay away from jurors. The man in question – seen often in the gallery - was the father of one of the Prosecution team of lawyers. Though the judge’s calling of the jury and her address to it in full court apparently “released” the matter of the Patterson sky train platform from the publication ban, there is every reason to believe it was NEVER covered by the ban - in the way I have reported it here. And yet all who report from the court said nothing about it until the jury was addressed in full court about the matter by the judge. Many followers of the trial were asking – “Why the silence?” “What’s going on?” As silence in a trial spreads, damaging speculation arises, speculation harmful to the administration of justice – and, perhaps, unfair to people involved in the process. In a democracy the public’s response to the suppression of trial information cannot be brushed aside as irrelevant. By the same token, the other major occupation of the week was an on-going argument between Crown and Defence about the limits of the ‘admission of facts’, the agreement between the two made at the time when trial by judge and jury replaced the earlier election by Defence for trial by judge alone. That document has played a large part in differences between Crown and Defence and will probably go on doing so. Depending on rulings made by Associate Chief Justice MacKenzie, the document governs (among other things) where Defence may go in search of corroboration of their major strategy and what kind of questions they may ask in certain circumstances. The people of the province have a right, I believe, to know about that aspect of the trial, which often requires the absence of the jury and much time to iron out disagreement – often, finally, through the instrument of a ruling by the presiding judge. The people of the province - by knowing about that major source of difference - may come to understand why there are sudden and sometimes long stretches when the jury is not present – and when witnesses don’t appear to testify and be cross-examined. Explaining that situation to readers does not expose “evidence, submissions, rulings and reasons for judgement given in this proceeding in the absence of the jury”. It shows respect for the public for whom, after all, the trial is being conducted! I believe – and I am almost certain the trial judge will agree – that over the next months of trial those in the courtroom who write must tell the public a good deal more than we have been doing about the matters dealt with “in the absence of the jury”. It is our responsibility to do so. And, I would add, I believe it is her ladyship’s responsibility to make clear to the press and media and members of the public in the gallery that they have larger scope to report and comment than they have, heretofore, believed. about defending champions Italy being ousted in the first round? the sale of BC Rail where we continue to see unpredictable events. with key officials in the Gordon Campbell government. headline and will sell some papers. had access to information? Who made the decision to sell BC Rail? questions directly deal with the issues before the court. objectionable without hearing an answer? I have great difficulty in understanding their motives. The long-delayed Basi-Virk/BC Legislature Raid case has once again gone a week without any evidence presented to the jury. Associate Chief Justice Anne MacKenzie dismissed both the jury and witness Martyn Brown, Premier Gordon Campbell's Chief of Staff, until Monday June 28 at 11:15 a.m. due to the need to hear legal arguments that cannot be reported because of a publication ban. Lawyers made submissions in the absence of the jury Thursday, details of which can't be revealed due to a publication ban. This week the jury has only been in court briefly, on Wednesday, but didn't hear evidence. Then you could go over to Ross' joint and get the real story with Are There Mockingbirds In The RailGate Courtroom? How the heckfire are we not going to wonder if there isn't something not quite straight-up going down during a whole week of publication-banned "legal wrangling" that broke out immediately after a single objection by the prosecution in response a defense question that about another another familial releationship that involves one of the lead RCMP investigators on the case and a high ranking BC Liberal Party apparatchik? The days were long and the wrangling uninterrupted among counsel for Prosecution and Defence. The gallery had as many as 35 in attendance, and as few as ten. Yesterday's wrangling was all assumed to be under the publication ban, but probably wasn't. The air cleared today as the whole jury was called in to be chatted to (instructed) by Madam Justice Anne MacKenzie. She took up the matter of a man on the Patterson sky-train station last Wednesday afternoon, recognizing two of the jurors, approaching them and making reference to the trial in which they are jurors - the Basi, Virk, and Basi trial. The jurors - properly - informed the sheriff of the brief encounter... and that began much of the discussion of yesterday which some believe is under publication ban. Jury members also chatted about the event. As it happens, the key matter is that Madam Justice MacKenzie asked any member of the jury to signify by raising a hand if he or she believed the event and its aftermath in any way affected his or her ability to continue serving as juror. None raised a hand. Madam Justice MacKenzie was careful to assure the jury that the man in question was in no way connected to the accused or to any counsel for the accused or to any supporters of the accused. And, in fact, justice MacKenzie said, he was the father of one of the Special Prosecutor team and that the fact was without any significance. The jury filed out. Then the afternoon was filled with procedural wrangling that is scheduled to go on tomorrow - with such certainty that the jury is excused attendance until at least next Monday. Gordon Campbell's Chief of Staff, Martyn Brown, growing old while he waits to finish his examination by counsel, may be getting impatient. He can repeat to himself the great lines of the English poet John Milton: "they also serve who only stand and wait". As Robin points out above, it appears that the jury won't be present until next week - but the public can be there and "know" what is happening. It becomes questionable just how and to what degree one's knowledge can be shared or disseminated. As Robin suggests, the Lamestream media tends to use this to justify their preferred approach. Bombshell allegations were under discussion during the last two days but I believe that I can only write on what was said in front of the jury. This shocking revelation caused the gallery to stir and forced the Judge to tell the jury that this "Won't happen again!" The jury was asked if they can continue and they all agreed. This type of situation could not be dreamed up. Any contact with a jury member risks the allegation of jury tampering. This is outrageous behaviour and I beleive that the Special Prosecutor and his team need to be held accountable. Unfortunately, nobody in the accredited media will ask the tough questions of Mr. Berardino. For example, what did the Special Prosecutor know and when did he know it? I can assure you that if a blogger approached a member of the jury there would be howls of outrage from the Crown and the RCMP and a full investigation would take place. Another shameful day for so called "justice" in BC. Things have gone from weird to truly bizarre. Amazingly Glow Ball Snooze at Six actually mentioned the Patterson Station "Approach" with a 20 second interview that allowed David Basi to express his horror that the prosecution would engage in such tactics. Even more of a treat is the observations of North Van Grumps who was also in the courtroom and seems locked in a mano a mano battle for the Peoples' Pulitzer with the Citizen Journalist from 54! NVG's stuff is here at the Gazatteer's comment thread! According to the VLCSCL (Vancouver_Law_Courts_Supreme_Court_List), for this morning, both Basis and Mr. Virk will be appearing in front of Justice MacKenzie to deal with case 23299 - the legal NON-brief that just could last forever. There was another delay at the Basi-Virk trial Tuesday and it is expected to continue into Wednesday morning. The jury did not hear any evidence Tuesday but was told to return Wednesday. There have been discussions in the jury's absence, which cannot be reported. The judge has imposed a media ban on publishing anything heard in court without the jury. It is now after 12 noon and the jury still hasn't been called into court. The only other item of particular interest to BC Rail cultists was the news that "oh so" Special Prosecutor William Berardino was found faultless and a very "good boy" regarding allegations of conflict of interest because of his donation to Wally Oppal's campaign while serving as SP. The findings were no surprise, just as the fact that the fact that Mr. Berardino was law partner with the sitting AG for many years previously and was partner's with Allan Seckel, the man deciding what requested evidence in this very case is protected by privilege, or not - wasn't even considered as a potential conflict. According to these rules if Gordon Campbell is ever investigated by a Special Prosecutor, may I suggest appointing his mother to the task, after all, what bias could she have? Actually, she knew him before he has his very own Public Affairs Bureau. The Sun's coverage is here and that of the Globe and Mail, there! I apologize for not being able to post for the last few days. Just unable to find transportation to and from the courts. Last week we began to hear more about the family relationship between RCMP Team Commander Kevin Debruyckere and BC Liberal Party Executive Director. As if on cue, the sharp sounds of police sirens could be heard in courtroon 54 as Michael Bolton began to ask questions of Martyn Brown and his dealings with Kelly Reichert and if Mr. Brown knew of his family relationship with RCMP Team Commander Kevin Debruyckere. Defense counsel has been allowed to engage in meaningful cross-examination for the last few weeks of Mr. Brown, despite unwarranted objections by Special Prosecutor Bill Berardino. Bill Berardino raised an objection to the line of questioning regarding the BC Liberal Party and the RCMP. I don't think that I can report on what was said about the objection but can say that his objection was based clearly on the questions around the key relationship with the head of the BC Liberal party and Kevin Debruyckere who was in charge of the RCMP. Why did he object to that line of questioning? I had thought that today we would begin with those questions about the RCMP but we had another strange twist to this case that I cannot report on. However, I can say that the issues dealt with this morning are very serious and raise more questions about how this case has been handled. They're Back in the Saddle Again! Let the evasion re-commence and prepare the engines for failure to be responsive. The Trial of the Millennium swings back into action again this morning at 10:00am, though there was some talk last week that sessions may start later due to a course a juror is involved in. 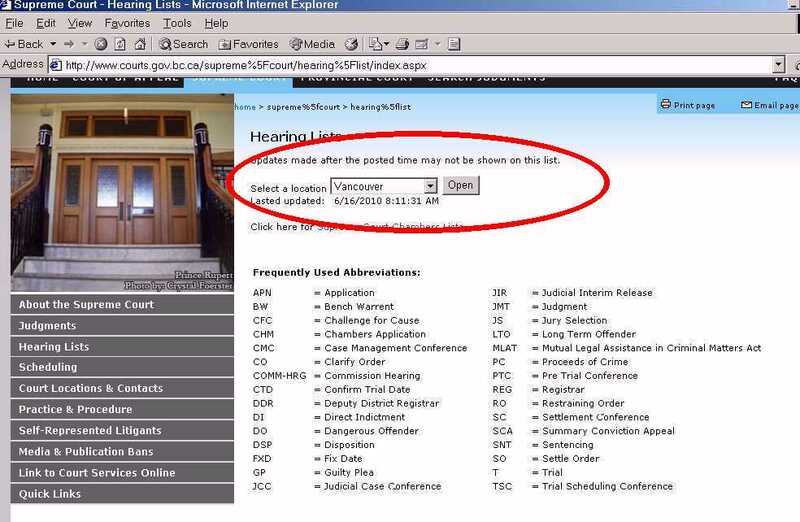 After all we don't expect the information at the attorney general's court service website to be accurate. We know this partly from experience - knowing the court is meeting when it isn't on the schedule or having it scheduled, trudging on down and voila, no court today, matey! Then just when I was going to set today's schedule to music and record a mega-platinum CD based on it I read on down the warning and discovered that I better not do that. Even though today is the Summer Soltice, it is still apparently a working day at Vancouver Supreme Court. However Case 23299 (Basi-Virk et. al.) is on hiatus until tomorrow. According to pages 53 and 54 of the current completed cases (from last week) the next appearance for the BBV crew is tomorrow June 22 at 10:00AM in Courtroom 54. "...we have no intention of privatizing BC Hydro. We will not sell or privatize - Hydro Dams, Transmission Lines, water resources, blah, blah, blah." "In addition, we will not sell or privatize BC Rail!" The voter had written with specific questions for the Man from Marathon and upon receiving the answers above probably even voted for the WHPinC (White-haired Prevaricator-in-Chief)- to his everlasting dismay, no doubt! This is documentary proof that Gordon Campbell can LIE without even moving his lips. Of course we wouldn't expect any less from our own Prevaricator-in-Chief! I'm sure that there were probably enough phoney letters like the above cluttering mailboxes from Atlin to White Rock, back in the day, and the lying just goes on, only lately it would seem even under oath! * Anyone wanting a high resolution copy of the letter above can e-mail the koot with "promise2001" in the subject line. It is perfect for framing to hang next to the silk screen montage of the Maui drunk shots! International Airport in 2007. The first surprise is that Mr.
Justice Braidwood appears to have done a good and honest job. in-council appointed aides, now before the courts. whole thing as wrongfully initiated. Expensive. That sparked the present civil case against Wally Oppal. flashing– the CanWest specialty when the big rotten boys are involved. four officers are still drawing public pay is an absolute disgrace” Wow! Who does Ian Mulgrew think he’s kidding? not approved of by senior officers? the matter while it was still steaming with suspicion? expectation by senior officers of the Force. get the little guys, protect the big ones. Do a Basi, Virk, and Basi on the bad boys of the Dziekanski affair! the actions of the little guys. Pretend. Smoke and mirrors. actions of specific members or saying anything about specific actions”. Why not finish with Vaughn Palmer in the same day’s Vancouver Sun? has to happen. Period. That’s all.” Smoke and mirrors. we could talk about that it’s such an obvious boondoggle. about the one million a year paid to the U.S. import David Hahn, B.C. back in the people’s hands?" Affair is beginning, already, to look like the BC Rail Scandal. 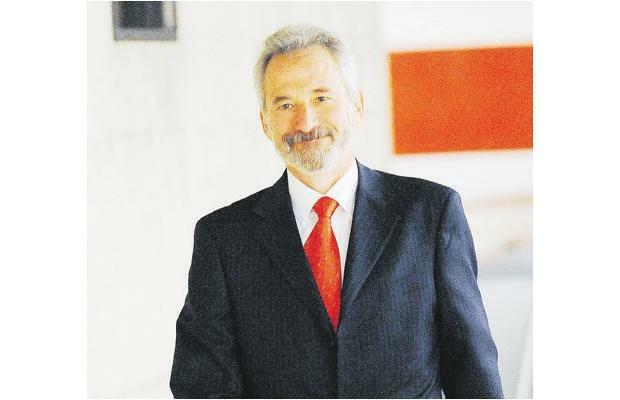 Neal Hall, having an opportunity to publish in the Big Paper, the National Post, hones in on defence lawyer Mike Bolton's questions about the famous dinner at the Villa del Lupo attended by finance minister Gary "Ferret" Collins, executives from Ominitrax and a herd of undercover RCMP posing as diners, busboys and other staff. VANCOUVER - British Columbia's then-finance minister Gary Collins was under police surveillance in 2003 while meeting with executives of a U.S. bidder for BC Rail, a Vancouver jury heard yesterday. Mr. Collins ignored the advice of a "fairness" consultant that ministers were not to meet with bidders before the bidding was closed, and met the top executives of Denver-based OmniTrax for dinner at a posh Italian restaurant in Vancouver. 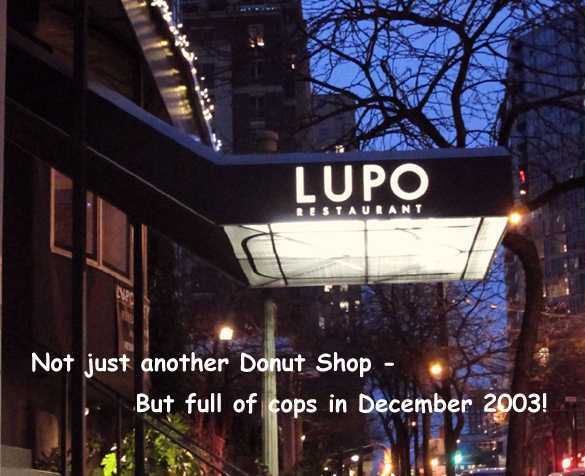 The dinner took place about two weeks before police raided the B.C. legislature on Dec. 28, 2003, and carted away boxes of material. Why Mr. Collins was under surveillance during the meeting was not explained to the jury at the trial of two former political aides accused of corruption in the BC Rail sale. But defence lawyer Michael Bolton suggested yesterday to the Premier's chief of staff, Martyn Brown, that Mr. Collins was trying to offer OmniTrax a "consolation prize" for staying in the BC Rail bidding. "I strongly say that never happened," Mr. Brown testified. "I would emphatically deny that." He also said he had no memory of any discussions about the defence allegations. Oops, I copied almost the entire article! But then it wasn't much of an article and it didn't have anything new to say - the dinner at Villa del Lupo is old news and for Martyn Brown to either not remember or deny anything he apparently does remember is pretty much same old, same old, also! Our man, a genuine journalist who is not a member of the "accreditation panel" Bill Tieleman, as usual goes into more detail about the games Mr. Brown played on Thursday, the full story of which can be found at his place in Patrick Kinsella never lobbied me. Premier Gordon Campbell’s chief of staff strongly denied defence allegations Thursday that B.C. Liberal Party insider Patrick Kinsella was working for both sides at the time of the $1 billion sale of B.C. Rail to CN Rail. Martyn Brown denied repeated allegations from a lawyer representing one of three former government aides facing corruption charges related to the sale, that Kinsella was “working both ends” in the $1 billion deal. How much a person can care who can't remember anything is somewhat perplexing, but then the fact that (in)Justice MacKenzie doesn't suggest that Mr. Brown be more responsive to questions is perplexing as well! Professor Emeritus Robin Mathews, THE leading correspondent on ALL issues regarding the Kafkaesque events arising from the Legislature Raids continues to challenge the forces of injustice on behalf of the public's right to know what is happening in THEIR so-called justice system. Though the modest Dr. Mathews downplays the importance of his ongoing struggle to be treated fairly and with respect, all 17 or 19 of us "Railgate Cultists" and the ILK who follow The Legislature Raids think otherwise. We think not only should Robin be accredited, only so he can use a recording device in the courtroom, but that Keith Fraser and the rest of the Glow Ball/Canned Waste and one CeeTeeVee drones who in their capacity as some kind of "accreditation panel" should be ashamed of denying THEIR BETTER the right to serve the public interest, a public interest in which they obviously HAVE NO INTEREST in serving! The (minor, minor, minor) saga of the attempt to get accreditation goes on. Here are the three last letters. This e-mail is to ask you to grant me journalist accreditation for the Basi, Virk, and Basi trial. I have been covering the pre-trial hearings for three and a half years for two websites: vivelecanada.ca and the legislature raids site. As well material I have written has been published in magazines and newspapers, etc. I have been a radio producer for CBC. I have written text books, books on culture and politics, articles galore, etc. I am an adjunct professor at Carleton University after forty years of university teaching ... and publishing. The "committee of journalists" rejected my request for accreditation for reasons that may not be examinable - I don't want to engage in any dispute with them. I have - over the years - criticized CanWest and three of the four work for CanWest. They assure me that has no relation to my rejection by them. They allege I am not a "working journalist" - though what the definition is seems strange. Spokesperson Neal Hall said I could approach the judge. I wrote to her and she has not replied. The other day one of the committee (attending the Basi,Virk, and Basi trial) said I should go to Criminal Registry and get an application form, fill it in, have it stamped, and Madam Justice Anne MacKenzie would respond to the formal application. I went to Criminal Registry and was sent to Sherriff's counter and was sent to Administration and was handed a sheet with a website address and told the form would be on it. Yesterday, with the Courts librarian I went to the website address - and no form is included on it. From there I went back to Administration, and after some talk, the head there told me that the form isn't on that website and that I have to contact you - not face to face. But by telephone or email. I telephoned you, and when there was no answer I hung up. And so now I am writing to you by email. I will be happy to hear from you on this subject. Accreditation permits the accredited person to use a recording device in order to assure accuracy of reporting. Since I report regularly and have been doing so for three and a half years, I believe the court will be interested in assuring the information I convey is accurate. I will appreciate hearing from you without too much delay since the trial is in progress right now. I am writing to acknowledge receipt of your recent correspondence, both by way of letter and email. I understand that the accreditation committee, which is external to the Court, rejected your request for journalist accreditation, a decision with which you disagree for the reasons you set out. As you observe, accredited journalists are permitted to bring recording devices into the court room for the limited purpose of using the audio recording to verify the accuracy of their notes. My colleague Ms McBride has written a letter to you to describe the steps that you may take to pursue the matter from this point. The letter and enclosures was sent to you by mail on Monday. I attach for your information, a copy of the letter (without attachments) that was sent. Associate Chief Justice MacKenzie is aware of your correspondence. Since you have been writing to the court for some time now, I expect you are aware that judges do not engage in correspondence concerning cases that come before them for hearing. That is part of the role that Ms. McBride and I have as lawyers for the Court. Hence you should not expect to receive a reply to your correspondence directly from Associate Chief Justice MacKenzie. If you wish to engage the court’s formal process by bringing an application, it is open to you to do so as Ms. McBride’s letter states. Then our Dr. Mathews responded thus, and this is where the exercise against arrogance and ignorance stands for the moment. You know, of course, I am fully aware that judges don't answer the letters of ordinary Canadians. I have no opinion on that matter. But I do know that ordinary Canadians have a perfect right to write to judges. If judges choose not to have letters of gravity answered by court officers (such as yourself), then, of course, the judges will face what criticism they evoke by ignoring communications. Judges are - after all - public servants in the very best and highest sense of that phrase. Associate Chief Justice Anne MacKenzie has chosen to ignore completely my second reasoned and concerned letter about the wrongful appointment of William Berardino as Special Prosecutor in the Basi, Virk, and Basi case. She has doubtless made that decision in the full consciousness of its implications. Thank you again for writing to me. I await the material sent by Ms. McBride and I am grateful to her for sending it. I shall consider, upon receiving the material, whether to "engage the court's formal process by bringing an application". My letter to you recorded a muddle in the Supreme Court in which it took me three days going from post to post to post to get to the point of being advised to write to you. While the time of court officers is held, it seems, at the highest value there, the time of ordinary Canadians seems to be considered worthless. I want court accreditation. I may "engage the formal process by bringing an application" to attempt to get accreditation AND to report to an already concerned public the behaviour of the Supreme Court of British Columbia towards those who (in the words I choose to use) are not in its charmed circle. That I should be weighed for accreditation by a "voluntary" committee of the British Columbia Supreme Court made up of three CanWest employees out of four on the committee is simply unacceptable. That you should characterize that committee as "external to the Court" is baffling! In what way can a committee be "external to the Court" that has acted with the full authority of the Court and with the knowledge of the Associate Chief Justice who accepts its decision? The committee's decision is final (and acceptable to the Court), unless - in your own words - I wish to make an application which, in effect, is to appeal the decision of the committee. Your statement that the committee is "external" to the court is, I believe, "chop logic" of the first order - a statement that is intended to be incomprehensible to sane people of normal intelligence but which suggests the court is not responsible for actions over which it exerts control. I believe I was considered by a committee that reasonable men and women reject out of hand. Dear readers, please forgive me for not being able to resist a bit of bolding at the end there, as there is only so much B.S. one can tolerate in silence - Reading this foolishness must be like listening to Martyn Brown "testify" in court! Not wanting to put a damper on an easy trial here for the defendants, there's one problem that has cropped up that hasn't been considered by keeners who have cross referenced 8000 pages of disclosed documents. Many have mentioned Martyn Brown's performance as a Chief of Staff, and of those to follow in his footsteps, but think on this. Witness Martyn Brown cannot turn to a Deputy and ask for more information before he responds to a question from a Lawyer, whether it be a Special Prosecutor or a Defense Lawyer. He must wrack his brain for an explanation as to whether or not he recognizes a document. His usual response is: "I don't remember"; "I can't recall"; "No, I've never seen that before". "I can speculate" (and he's allowed to do so by the Court). His usual overall answer is that its been almost eight years since the BC Rail raid began, and since then, many, many, many (his words) other issues have come, and gone. His retention for a name may last three months, and then he's moved on. While WE have been pouring over the 8,000 pages daily, held in trust online at BC NDP headquarters, the BC Liberals have as good as shredded them from their minds. The BC Liberals don't go back and look, to refresh their minds, because they KNOW that the testimony must be done from MEMORY. "Premier, adviser do the interesting stuff off camera"
By Vaughn Palmer, Vancouver Sun June 2, 2010"
"Opposition leader Carole James led off the annual legislature debate on the budget for the office of the premier Tuesday by putting Gordon Campbell on the defensive over his handling of the Kash Heed fiasco. The back-and-forth over Heed occupied an hour or so in the main legislature committee room. But that was by time expired on the clock. Campbell's answers occupied much less time, because he spent almost as much time framing them as he did delivering them. A typical exchange went as follows: James poses question. Campbell enters into lengthy consultations with his deputy minister Allan Seckel, sitting on his left side. Seckel, like a lawyer instructing his client, does most of the talking. Premier occasionally takes notes. Sometimes the consultations extend to a second deputy minister,....."
* - NVG - cc_ing BC Mary at this time is of little value. 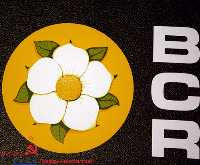 I am trying to look after the Legislature Raids here and have access to the blog. However I do not monitor Mary's email, and at this time I don't even know if Mary is monitoring it on a very regular basis. Therefore if you care to submit anything for publication here on the front page at TLR, please e-mail it to kootcoot@hotmail.com. You can of course leave comments here at the Ledge Raids as usual, but I do check my own e-mail more frequently than I check the back end here to see if any comments need moderation - so e-mailing items to the address above is likely to result in quicker action on the item. The advice above applies to anyone else with information they would normally have submitted to Mary for use/publication here at The Legislature Raids. The continuing and ever more Kafkaesque adventures of Robin Mathews and his ongoing attempt to use a recording device (be accredited as a big boy of journalism) in the courtroom in the interests of accuracy and dissemination of the truth. Bring in the Clown, Martyn Brown, Again! 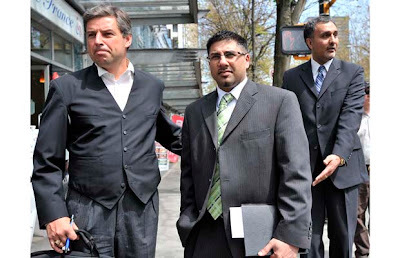 VANCOUVER - Former finance minister Gary Collins was under police surveillance in 2003 while meeting with ...The Basi-Virk trial heard that Collins ignored the advice of "fairness" consultant Charles River Associates that ministers were not to meet with bidders before the bidding was closed. 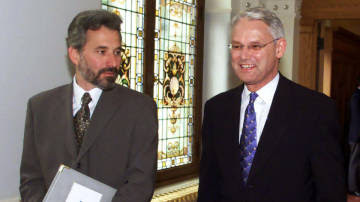 The finance minister, on Dec. 12, 2003, met for dinner at a posh Italian restaurant in Vancouver with Pat Broe and Dwight Johnson, top executives of Denver-based OmniTrax. The restaurant meeting took place roughly two weeks before police raided offices in the legislature on Dec. 28, 2003, and carted away boxes of material. Why Collins was under police surveillance during the meeting was not explained to the jury. But defence lawyer Michael Bolton suggested Thursday to the premier's chief of staff, Martyn Brown, that Collins was trying to offer OmniTrax a "consolation prize" for staying in the BC Rail bidding. "I strongly say that never happened," Brown testified. "I would emphatically deny that." The Province - Keith Fraser - ?14 hours ago? Globe and Mail - ?20 hours ago? Martyn Brown, chief of staff to Premier Gordon Campbell, defended his honour and integrity in the Supreme Court of British Columbia Wednesday, after he was challenged over his repeated memory lapses. In an emotional plea that was in contrast to the reserved demeanour he has shown in the witness box for the past two weeks, Mr. Brown asked Madam Justice Anne MacKenzie and the jury to accept that he honestly cannot recall events, e-mails or discussions he was allegedly involved in several years ago. In my attempt to carry on BC Mary's tradition, I went to the CSO or attorney general's helpful (hah!) website to check out the schedule for the fantasyland at the Vancouver Law Courts for today June 17, 2010 - or the place where Martyn Brown holds court while pretending he is as stooopid as he is venal. Well apparently there are NO TRIALS going on there today, or at least none that the powers that be are willing to share basic information (like whether it is scheduled or not) about. I gave up long ago trying to keep up to date with whether or not a hearing or actual trial session was happening on any given day, and have just referred to BC Mary when I cared to know. After all, since I don't live in the West End of Vancouver, what's the point - it isn't as if I would have time to decide to attend. Thus when I went to my blog to link to the schedule for today I found that my link to this was no longer valid. Just another little step by the genii in the office of the AG to make it a little more difficult for a citizen to know what the criminals it appears to be the purpose of the justice system to protect are doing. But according to the schedule, supposedly published at 5:56AM (and last checked by me at 8:15AM) this morning, as I said, there are NO TRIALS taking place today. There are nine pages of "Chambers Applications," whatever the hell those are, but not a single trial or pre-trial hearing listing at this link. 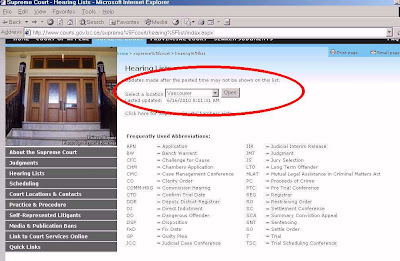 Once to this link, select the Vancouver Law Courts location and you too can find NO USEFUL INFORMATION. These guys are absolutely SHAMELESS and couldn't possibly be this useless - THEY HAVE TO BE DOING IT ON PURPOSE to cover their slimey, sleazy asses! One guy without a memory and another without a conscience! Now that the BC Rail Corruption Trial is actually underway the "real" journalists, the useless stenographers who should be proud to be on the same page as a Citizen from Courtroom 54 and ashamed to cash their pay cheques, even publish some observations from time to time. Well, at least when Lucinda Chodan, Kirk LaPointe or other lightweights deem their scribblings "newsworthy." Premier Gordon Campbell’s chief of staff said Tuesday he could think of no good reason why Patrick Kinsella was hired as a well-paid consultant by BC Rail just four months after Mr. Kinsella co-chaired the Liberals’ successful election campaign in 2001. Martyn Brown, testifying at the political corruption trial of former ministerial aides David Basi and Bob Virk, said he did not learn of Mr. Kinsella’s BC Rail hiring until the spring of 2004. “I expressed surprise … why would they hire him?” Mr. Brown told defence lawyer Michael Bolton. Nor was the decision good optics, coming so soon after the election, Mr. Brown said. If he had known about it at the time of Mr. Kinsella’s hiring, he would have asked questions, the Premier’s top political operative said. “I would have asked ‘why?’ because I don’t know what value he would bring [to BC Rail … and] the optics are not good. During earlier cross-examination, Brown praised the work of accused David Basi in rallying support for the government, including the period after the 2003 arrest of the premier for impaired driving in Hawaii. Bolton noted his client’s role of arranging for government supporters to call in to radio talk shows to ask “softball questions” of the premier. He said Basi was “particularly effective” at those activities, which have been characterized as political “dirty tricks” by some. Keith Fraser's surprisingly "hard-hitting" coverage today is even accompanied with a collage of Gordo's famous Maui mugshot photos. It's enough to make one wonder if some of these guys are trying to remember what a journalist is/was supposed to be and do, just because employment opportunities aren't that attractive doing P.R. work for unemployed and or imprisoned former politicians. I wouldn't think that being a Campbell lapdog or employee of the Public Affairs Bureau is a really comfortable and secure career these days. It was in the pre-trial stage that we learned that AG (Wally Oppal) had hired Stuart Chase to sit in on the proceedings, and this afternoon, while I steadfastly maintained my position at "B5", so too for the fellow next row closer to the Judge, and to the left of me at A4 (as if we were on a spreadsheet) said that these were the best places to watch the proceedings from, because "you can see the sweat on the brow of Mr. McCollough". Sure enough, Keith Fraser saddled up and onto A1 and another reporter slid into A2. Same thing happened at B1 and B2. Neal Hall occupied C13, Ian Mulgrew took over C 10. As to the lawyer being hired..... well that was the fellow in A4, for I noted after the morning coffee break that he had two newspapers beside his briefcase, with the title of "The Lawyers Weekly". It was after the afternoon coffee break I decided to break the ice with A4 and ask what he was doing here, the reply came back, RCMP aka the Horsemen. The RCMP? And reading the Lawyer Weekly..... "Oh," he says.... "Yes, I'm a lawyer too." "McCullough also questioned Brown about why Stuart Chase, a government employee, was sent to monitor the pre-trial hearings of the Basi-Virk case. He demanded to know why the government needed someone to monitor the case if its position was that they could not comment while the matter was in court. Brown replied that the government needed to be kept briefed and "the court process itself regrettably became very politicized on a daily basis. It was very difficult to know what we were going to be asked."" wonder if the reason for A4's presence is the same? For those who haven't attended Court Room 54, there aren't 150 seats, the public seating area is 6 deep by 13 wide. The Public Address system is mediocre at the best of times, and as the lawyer (Bolton) wanders away from his podium, to hand out document evidence to be read by Martyn Brown, and then commented on by Mr. Brown, so too does the sound level. When will the Court system adopt a button microphone for roving lawyers? There's constant questions from Madame Justice MacKenzie to the Defense Lawyer to clarify his question to the Witness, either because the question is actually two questions in one, and she wants them to be answered one at a time; or the question wasn't heard properly by Madame Justice MacKenzie, now this may sound like we're back at the Public Address system again as noted above, but no, the problem here is that although there is a designated court stenographer present, and creating the legal and binding copy of the proceedings, the Judge is busily typing on her laptop computer her version of what is taking place in her courtroom.....#54. By the way, even though I was at B5, I didn't see any sweat on either McCullough or Bolton's brow. The day began with Kevin McCullough continuing his detailed cross examination of Premier Gordon Campbell's Chief of Staff Martyn Brown. The MSM seem to be suggesting that 7 days of questioning should be more than enough, however given that Brown has had trouble remembering and that the emails and docs put to him do not help him recall key events, I can only hope that justice delayed does not become justice denied. The public needs to understand how the highest political office in BC operates and what political staff do in these jobs. Martyn Brown was shown more emails about the Premier's office knowledge that PATRICK KINSELLA was working for BC Rail and that Kinsella wanted to attend a Prince George conference about the future of BC Rail. It was then asked if Brown could recall any conversations he had with Bob Virk about the optics of having Patrick Kinsella at the Prince George given his close relationship to Gordon Campbell. Brown did not recall nor did he deny those conversations took place. After about 30 minutes of questions from Kevin McCullough, Michael Bolton began his cross examination of Brown. This was a complete surprise to me and it looked like Martyn Brown was surprised as well. I did not understand that each of the 3 defendents are allowed to cross examination of each witness. Each of the 30 witnesses will face a detailed cross examination about their part in the sale of BC Rail. The defence are using the government's own documents to hold witnesses accountable for their role in the sale of BC Rail. This strategy should be applauded as the public have a right to know what happens when a railway is sold to supporters of the BC Liberals. Mr. Bolton is an experienced lawyer and began his questioning about the role of Mr. Basi in securing "validators". Mr. Brown stated that Basi had excellent interpersonal skills and was very political. He confirmed that Basi was asked by the Premier to speak to the political staff at a retreat outside Victoria and discuss how the political staff should approach supporters of the government and why we need to be more active in stakeholder outreach. Mr. Brown stated that he probably led a standing ovation for Basi and that KELLY REICHERT from the BC Liberal Party attended. Mr. Bolton then asked if Brown knew about Premier Campbell thanking Basi for arranging softball questions for a talkshow hosted by Rafe Mair where Campbell was facing an agressive Mair who wanted to ask the tough questions. After many of the softball callers gotten through, Rafe Mair changed his tone and Premier Campbell was very appreciative of Basi's efforts. The next line of questioning were about Patrick Kinsella and detailed how he began work for BC Rail in the fall of 2001. Mr. Kinsella was paid close to $300,000 for his political savvy to the board of BC Rail which includes witnesses JOHN MCLERNON and BRIAN KENNING. Mr. Brown stated that he "could not think of a good reason" why Kinsella would be paid $6-$7 thousand a month from BC Rail. An outrageous sum of money from the BC taxpayers. 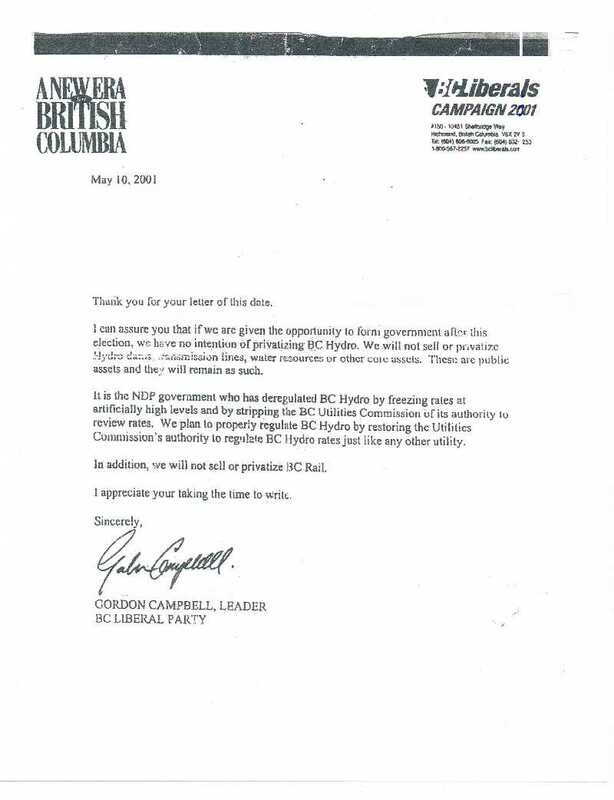 Bolton asked why Kinsella who was the BC Liberal co-chair for the 2001 election campaign why BC Rail would hire a close friend of the Premier. Mr. Brown could not recall and agreed. After a brief break, Mr. Bolton accidently referred to Mr. Brown as Mr. Kinsella. A few chuckles were heard and Justice Mackenzie corrected Bolton. Bolton has reviewed many Kinsella documents and had a slip of the tongue. I can only imagine the emails and documents where details of Patrick Kinsella's dealings with BC Rail and the government are archived. Mr. Patrick Kinsella's dealings with BC Rail and close relationship to Campbell and other cabinet ministers will continue to be questioned by the defence in order to learn the truth about the backrooms where the deals are made in BC politics. The theme of the day was Mr. Patrick Kinsella. A longtime backroom political insider that is a close confident of Gordon Campbell. Mr. Kinsella was the BC Liberal election campaign team co-chair in 2001 along with Christy Clark. According to testimony from Martyn Brown, Mr. Kinsella is also a fundraiser for the BC Liberals and has donated thousands of dollars to the BC Liberals both personally and through his company, Progressive Strategies since 2000. The defence posed questions to Martyn Brown as to how, just 4 months after the election, a key member of Gordon Campbell's inner circle was able to secure a $300,000 contract to advise BC Rail and provide "political savvy". Mr. Brown admitted that the optics of having Patrick Kinsella working for BC Rail following the election "were not good." When asked about was there a reason why JOHN MCLERNON hired Mr. Kinsella to advise the BC Rail, Brown responded, "I can't think of any good reason." 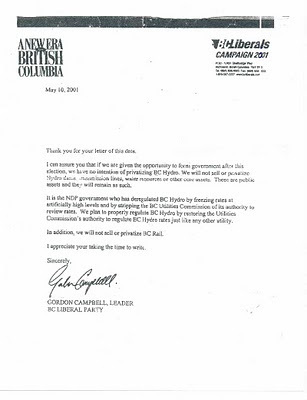 There was a suggestion that Premier Gordon Campbell sought opinions from Kinsella about potential BC Rail board members, given that the Premier had appointed the BC Rail board. Brown responded that Kinsella "may well have been consulted by the Premier for board appointments." There is no doubt that Patrick Kinsella played a role with the sale of BC Rail. It was alleged in court that he had signed a confidentiality agreement regarding BC Rail, something that Martyn Brown was not aware of. Unfortunately, Justice Mackenzie did not allow some documents to be marked as exhibits and the public cannot review them. I will attend again tomorrow to provide my insights. Your eyewitness accounts from the courtroom are highly appreciated by BC Mary and all her readers. Mary has some unsual things affecting her life at present and cannot at all times be on top of the Ledge Raids for a temporary period of time. I have agreed to help monitor the blog, moderate comments and such, when I have the opportunity, my plate having other things on it as well. For especially valuable contributions like eyewitness, daily accounts from the courtroom if one mails them to kootcoot@hotmail.com, they may see publication faster than leaving them only as comments at the blog. Either way they will eventually be published however. Since CBC radio, TeeVee and Glow Ball all seem to be doing their best to ignore the fact this trial is even going on and the Canned Waste stable of stenographers seem to be going out of their way to minimalize the issues or miss the point entirely, contributions like yours are especially valuable. BTW, Robin Mathews, you too, as you often do already may find sending me your copy a quicker way to get it up at Mary's place for the present. with the premier's Chief of Staff, Martyn Brown, expected to be in the witness stand again, to continue answering to Defence attorney Kevin McCullough's cross-examination. Neal Hall has a report in Vancouver Sun which offers little information except that Kevin McCullough (defence lawyer for Bobby Virk) has finished cross-examining the premier's chief of staff, and Michael Bolton (defence lawyer for Dave Basi) has begun his questions. His story is HERE. Attending court today and have more notes from yesterday. I apologize but these old hands have trouble typing. Martyn Brown testified yesterday that he was shown documents by Special Prosecutor associate Andrea Mckay. What was the purpose of the doc? Did it give Martyn Brown a chance to formulate a response? Very troubling behaviour for the Special Prosecuter to try to tip off witnesses for cross exam questions. Given the detailed cross examination of a key witness to the Premier and a supervisor for Basi and Virk I can only guess what questions are in store for other witnesses. More later at the lunch break. More names were raised today and more possible witnesses. The day began with Kevin McCullough continuing his detailed cross examine of Premier Gordon Campbell's Chief of Staff Martyn Brown. The MSM seem to be suggesting that 7 days of questioning should be more than enough, however given that Brown has had trouble remembering and that the emails and docs put to him do not help him recall key events, I can only hope that justice delayed does not become justice denied. The public needs to understand how the highest political office in BC operates and what political staff do in these jobs. A tip of the ol' tuque to you, Citizen Journalist from 54, you're doing a great job! Many thanks indeed. And if you ask me, the public is beginning to make its presence felt, too, if only in a few chuckles ... but people are visibly there, determined to inform themselves about this important trial. That has to be a very good thing. It means that the public interest can no longer be overlooked.